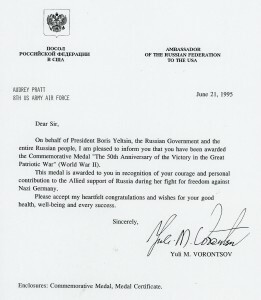 In 1995, the Russian Federation decided to award medals to about 9,000 Americans who had supported the Russian war effort in World War II. 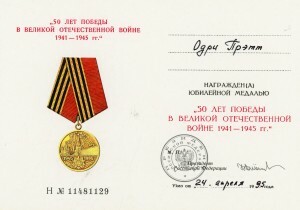 Many of the recipients were merchant seamen and Maritime Service personnel who had brought in millions of tons of supplies, equipment and food in the Murmansk Run. Others were involved in the Army Air Forces shuttle bombing missions in and out of Russia. 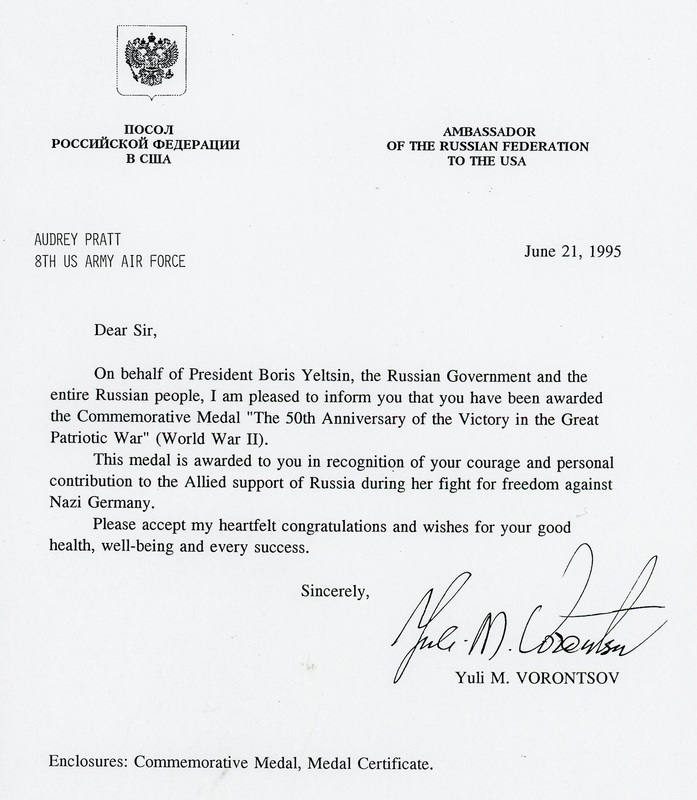 “On behalf of President Boris Yeltsin, the Russian Government and the entire Russian people, I am pleased to inform you that you have been awarded the Commemorative Medal “The 50th Anniversary of the Victory in the Great Patriotic War” (World War II). The medal was also accompanied by a small cardstock numbered award booklet bearing the name of the recipient and illustrating the medal. In this case, the recipient was Lieutenant Audrey C. Pratt, Army Nurse Corps. Lt Pratt served in Eastern Command, US Strategic Air Forces in Europe, being recommended for promotion to first lieutenant in August 1944. She entered active duty in October 1942 and went overseas in August 1943. 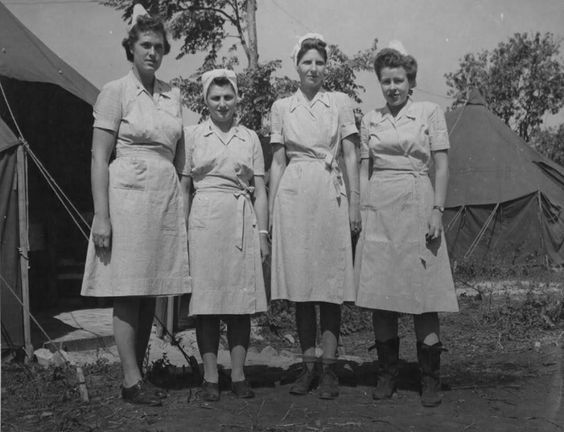 Here’s a photo of four US Army nurses in Russia, including Lt Audrey Pratt. Left to right, the nurses pictured are: Lt. Audrey Pratt, Lt. Margaret Potaki, Lt. Goldie Roberts and Lt. Lucille Rosedale. My father Frank O Moore served in the Persian Gulf Command 1943-45 and I would like to see if possible to still obtain a medal for him He is 93 and in a skilled nursing facility speaks of his service often. My cell phone is 919-624-0127. I’d suggest contacting the Russian Embassy in Washington, DC.